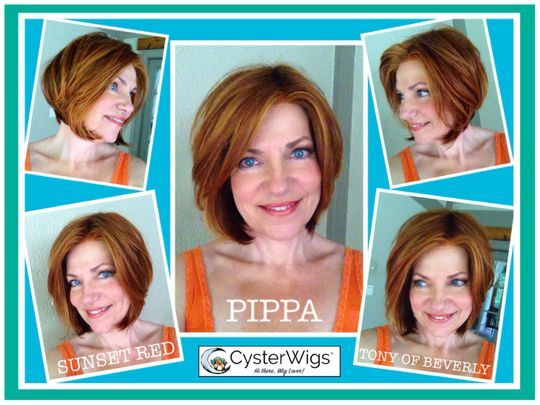 Pippa by Tony of Beverly is a 100% hand-tied lace front, monofilament top, angled bob that sweeps down from just past the nape to below the chin for a style that is flattering on all face shapes. - Bang: 8" to 9", Crown: 8" to 8.5", Sides: 7" to 7.5", Nape: 2" to 2.5", Overall: 11" to 11.5"
Pippa – the 100% hand tied monofilament top, ready-to-wear lace front version of Tasha – is an elongated bob that is slightly forward at the chin with side-swept bangs and a beautifully beveled nape. The 100% hand tied lace front allows for off-the-face styling that can be parted anywhere at the crown and look natural thanks to the monofilament top, which looks like your own hair and scalp. I personally did not think this wig construction was nearly as good as the Jon Reneau collection. It did not have the extended nape either. The lace front was nice but the knotting seemed more noticeable to me than Jon Reneau’s pieces. The wig itself was very pretty just could not deal with the metal stay. Ann H. Reviewed by Ann H.
I really wanted to like this, but unfortunately it had to go back. It is very flat on top (did not look like the pictures) and I was afraid to mess with it too much because then I couldn't exchange it. Also, I ordered it in the color Kahlua (which I like), but this had wide streaks of highlights and was not flattering to me. I did like the length, and the hair fibers were nice, but back it went. I'm still searching for the "perfect" bob..
Penny I. Reviewed by Penny I. This is a lovely sleek style which I usually pin off my face. I really like the amount of hair, but feel somewhat self conscious about the lace front. It is more obvious than my other styles.